Yantras are sacred geometrical diagrams that are derived from ancient Hindu scriptures. They have been used for millennia for cultivating inner peace, prosperity, and abundance. They also protect from negativity, both physically and spiritually. The Ganesh Yantra facilitates the removal of obstacles, whether they are on the level of the spiritual, the emotional, or the physical. Perfect for starting new projects, health issues and beginning a spiritual practice. Ganesh yantra creates harmony and balance in one's life. Each yantra is hand-painted to order, and is created while invoking the mantra of that particular divine energy that the yantra represents. 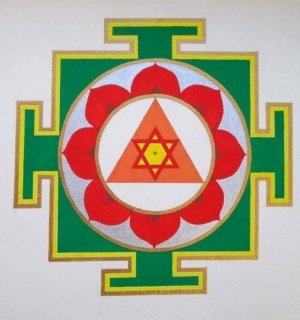 Each yantra will also be infused with Universal Reiki Healing Energy to optimize the healing potential of the yantra. Hand painted on 10 x 14 fine quality watercolor paper. Add $25 for International Shipping. 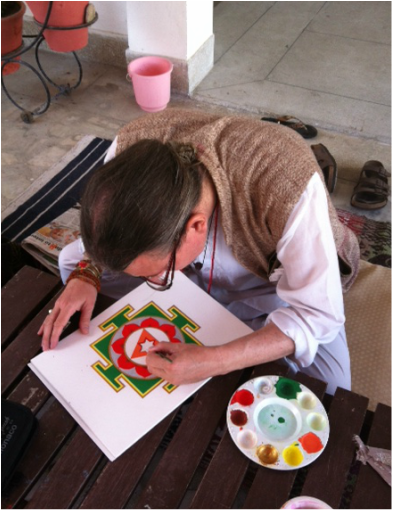 Dwain Dolan painting a Ganesh Yantra in Haridwar, India.